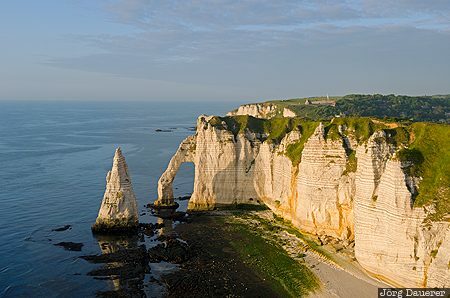 The chalk cliffs of Étretat with the natural sea arch Porte d´Aval and the needle Aiguille illuminated by warm evening light. Étretat is at the Côte d'albâtre in the Département Seine-Maritime in Haute-Normandie in northern France. This photo was taken in the evening of a sunny day in May of 2011. This photo is part of the exhibition Sea Arches (June 2018). This photo was taken with a digital camera.